“I teeter when I walk, I no longer drive, I look out the windows … My circles narrow. Each season my balance gets worse, and I sometimes fall. My fingers are clumsy and slow with buttons. I have problems with memory, sure, but it’s short-term memory … My summer nights are NESN and the Boston Red Sox. 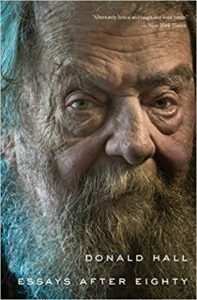 I enjoy multiple naps.” So did the New Hampshire poet Donald Hall define life after 80! I know, I know … I’m about the same age. I too enjoyed Sidney Bechet when I was younger (a famous New Orleans jazz hero for you younger lads and lasses). I too listened to Robert Frost in person (he “said” his lines at my high school in 1950 and 1951). And I too have tried my hand at poetry (the haiku). In these brief, enjoyable, humorous, and always challenging essays (Hall writes that he decided at eighty to dispense with his renowned poetry, after he served as the United States Poet Laureate, shifting to the essay). He describes poems as “ . . . image-bursts from the brain-depths, words flavored by battery-long vowels” that challenge our brains and imaginations, “ . . . delicate rhythms with forceful enjambments and an assonance of dipthongs.” These essays, fortunately, are less poetic! I enjoyed especially his warnings on writing: “Don’t begin paragraphs with ‘I’” (I failed that one!). “Avoid ‘me’ and ‘my’ when you can. . . . Avoid the personal pronoun when you can. . . . “ and “don’t be afraid of contradiction: it is the cellular structure of life. . . . The emotional intricacy and urgency of human life expresses itself most fiercely in contradiction”. Death, of course, is on his mind. “There is only one road” and “Of course all of us will be forgotten” but these essays demonstrate a life lived to the fullest, with humor and good feeling for his years in New Hampshire. 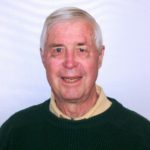 Donald Hall died quietly in Wilmot, NH on June 23, 2018. Do read these brief, succinct and poetic essays: perfect for the aging mind, as well as for those advancing inexorably to old age. Enjoy every moment! 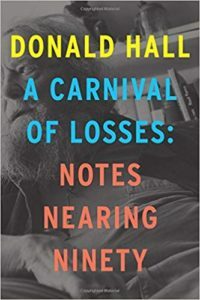 Editor’s Note: ‘Essays After Eighty,’ 2014, and ‘A Carnival of Losses: Notes Nearing Ninety,’ both by Donald Hall were published by Houghton Mifflin Harcourt, New York, respectively in 2014 and 2018. About the Author: Felix Kloman is a sailor, rower, husband, father, grandfather, retired management consultant and, above all, a curious reader and writer. He’s explored how we as human beings and organizations respond to ever-present uncertainty in two books, ‘Mumpsimus Revisited’ (2005) and ‘The Fantods of Risk’ (2008). A 20-year resident of Lyme, he now writes book reviews, mostly of non-fiction that explores our minds, our behavior, our politics and our history. But he does throw in a novel here and there. For more than 50 years, he’s put together the 17 syllables that comprise haiku, the traditional Japanese poetry, and now serves as the self-appointed “poet laureate” of Ashlawn Farm Coffee, where he may be seen on Friday mornings. His late wife, Ann, was also a writer, but of mystery novels, all of which begin in a village in midcoast Maine, strangely reminiscent of the town she and her husband visited every summer.